Giant corn! Light crunch. Premium. All natural. No trans fats!!! For the spice lover comes a mouth watering, chile-picante intense flavor to satisfy your craving pronto! 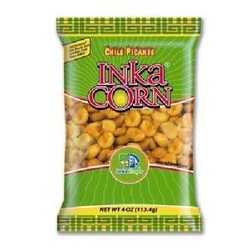 Only the largest, finest kernels are used in the preparing the roasted Inka corn for a delicious light crunch. We do not use ingredients that were produced using biotechnology. Product of Peru.